What is a public improvement lien? A person performing labor for or furnishing materials to a contractor, his or her subcontractor or legal representative, for the construction or demolition of a public improvement pursuant to a contract by such contractor with the state or a public corporation…shall have a lien for the principal and interest of the value or agreed price of such labor, including benefits and wage supplements due or payable for the benefit of any person performing labor, or materials upon the moneys of the state or of such corporation applicable to the construction or demolition of such improvement, to the extent of the amount due or to become due on such contract…upon filing a notice of lien as prescribed in this article, except as hereinafter in this article provided. Who gets served with a public improvement lien? the lienor shall serve a copy of such notice or amendment by certified mail on the contractor, subcontractor, assignee or legal representative for whom he was employed or to whom he furnished materials or if the lienor is a contractor or subcontractor to the person, firm or corporation with whom the contract was made. A lienor having a direct contractual relationship with a subcontractor or a sub-subcontractor but not with a contractor shall also serve a copy of such notice or amendment by certified mail to the contractor. Where do I file a public improvement lien? a person performing work for or furnishing materials to a contractor, his subcontractor, assignee or legal representative, may file a notice of lien with the head of the department or bureau having charge of such construction or demolition and with the comptroller of the state or with the financial officer of the public corporation, or other officer or person charged with the custody and disbursements of the state or corporate funds applicable to the contract under which the claim is made. How long do I have to file a public improvement lien? 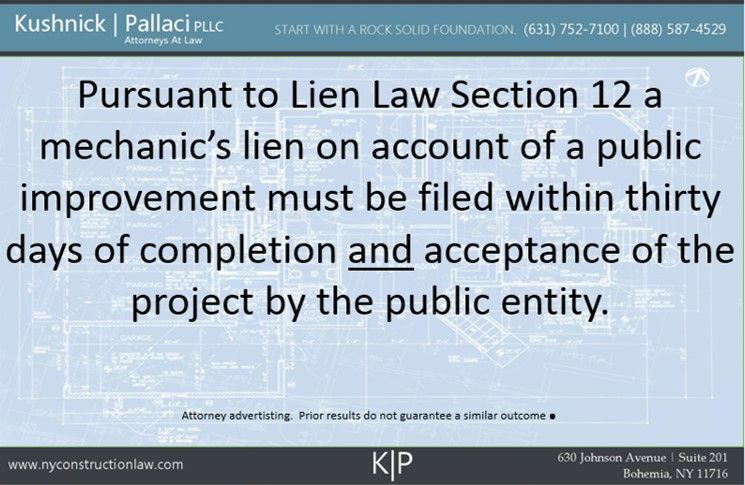 In New York a public improvement lien must be filed (Lien Law Section 12) within thirty days after completion and acceptance by the State or other Public Corporation in charge of the project. 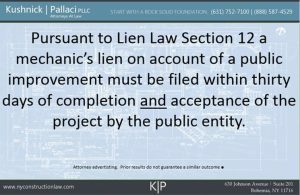 Lien Law Section 11-a allows you to demand that the public entity notify you upon completion and acceptance so that you know when your lien clock starts running. What information is required in a public improvement lien? state the name and residence of the lienor, the name of the contractor or subcontractor for whom the labor was performed or materials furnished, the amount claimed to be due or to become due, the date when due, a description of the public improvement upon which the labor was performed and materials expended, the kind of labor performed and materials furnished, and materials actually manufactured for but not delivered to such public improvement, and give a general description of the contract pursuant to which such public improvement was constructed or demolished. If the lienor is a partnership or a corporation, the notice shall state the business address of such partnership or corporation, the names of the partners, and if a foreign corporation, its principal place of business within the state. If the name of the contractor or subcontractor is not known to the lienor, it may be so stated in the notice, and a failure to state correctly the name of the contractor or subcontractor shall not affect the validity of the lien. The notice must be verified by the lienor or his agent, to the effect that the statements therein contained are true to his own knowledge, except as to the matters therein stated to be alleged on information and belief, and that as to those matters he believes it to be true. The construction attorneys at Kushnick Pallaci regularly prepare and file public improvement liens. Contact Jeffrey Lhuillier for more information. This entry was posted in Mechanic's Liens, Public Construction Contracts, Public Improvement Lien and tagged Liens, Public Improvement Liens, Public Works by VTP. Bookmark the permalink.